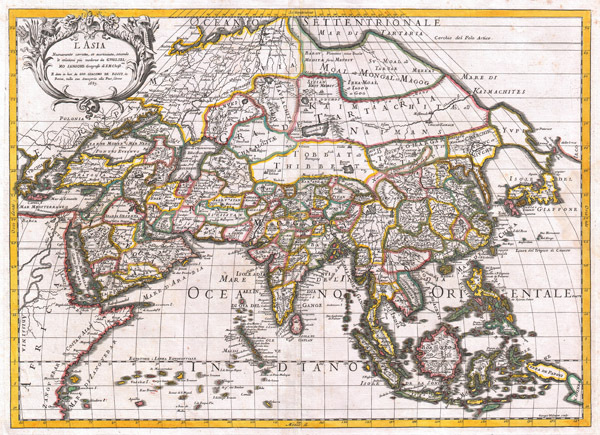 A spectacular 1687 map of Asia by the important Italian cartographer Giovanni Giacomo De Rossi. Depicts the entire continent as well as parts of Europe, Africa, and the East Indies. In drawing this map Rossi drew heavily upon Nicholas Sanson's map of Asia in ancient times. In East Asia the cartography is still fairly speculative. Hokkaido is shown attached to the mainland in a vast peninsula named Yvpi. Separated from this landmass by the narrow Strait of St. Vries is a mysterious landmass called Ieco, a name which itself is commonly associated with Hokkaido. West of Japan, Korea appears as a narrow peninsula after the Mercator-Honduis example. Further inland, in western China, Chiamay Lake is depicted. This mythical body of water was postulated by Ortelius as source for the great rivers of Southeast Asia. In a marked departure from Sanson's map, Rossi corrects the orientation of the Caspian Sea to the proper north-south axis. In the East Indies he separates New Guinea into separate islands, 'Terra de Papous' and 'N. Guinea.' In the far north the Mongol empire is labeled Magog, referencing Marco Polo's association of Mongolia with the Biblical land of 'Magog.' An attractive decorative title cartouche referencing the military prowess of the Saracens and the Mongols adorns the upper left quadrant. Prepared in 1687 by Rossi for issue in Giacomo Cantelli da Vignola's important Mercurio Geografico…. Giovanni Giacomo De Rossi (1627 - 1691) was an Italian printer and publisher active in 17th century Rome. Giovanni inherited the important Rome based printing business originally founded by his father, Giuseppe de Rossi (1570-1639), in 1633. It was hard work and dedication, from 1633 to 1691, that ultimately pushed the firm to the heights of its success. By the mid-17th century the Rossi firm was considered the most active and important press in Rome. Cartographically most of Rossi's work was issued in conjunction with the mapmaker Giacomo Cantelli da Vignola, with whom he issued the remarkable Italian baroque Atlas Mercurio Geografico. In addition to maps, the Rossi firm produced a vast corpus of prints that include the work of Gimbattista Piranesi (1720-1778), Benedetto Castiglione (1609-1665), Pietro Testa (1612-1650) and Giovan Francesco Grimaldi (1606-1680). The Rossi firm continued to flourish though several generations. In 1738 it was renamed Calcografia Camerale. More than 100 years later, in 1870 the Calcografia Camerale was again renamed Tegia Calcografica which it remained until 1945. Today the former Rossi press is known as the Calcografia Nazionale and is a free museum located at 6 Via della Stamperia, Rome. The print and printing plate collections of the Calcografia Nazionale are among the largest and most important in the world. Giacomo Cantelli da Vignola (February 22, 1643 - November 30, 1695) was an important Italian cartographer and engraver active in 17th century Italy. Cantelli was born in Montorsello, near Vignola Italy to a prominent local family. After studying literature at the University of Bologna, Cantelli took a position as secretary to the Marquis Obizzi de Ferrara. Eventually Cantelli relocated to Venice where developed an interest in cartography. He later traveled to Paris in the company of the French ambassador where became acquainted with the French cartographer Guillaume Sanson, as well as his contemporaries Jacques-Andre Duval and Michel-Antoin Baudrand. It was most likely the influence of these innovative French cartographers that inspired Cantelli's careful and meticulous approach, in which he based his cartography not just on earlier maps, but also very much in the French style upon accounts written by travelers and merchants regarding actual travel to foreign lands. Back in Italy, Cantelli took service Count Rinieri Marescotti, with whom he traveled extensively throughout Italy, becoming in the process acquainted with the Italian publisher Giovanni Giacomo de Rossi. It is with Rossi that Cantelli began officially publishing his maps. The earliest maps to bear the Cantelli-Rossi imprint date to 1672 and detail the Holy Land, Persia, and the Ottoman Empire. Around 1680 the duo also began to publish the Mercurio Geografico, a large format atlas illustrating all parts of the world in a splendid Italian baroque detail defined by elaborate finely engraved cartouche work, high quality paper, and bold Roman lettering, and dark rich inks. Some have compared his style go that of Giovanni Antonio Magini, another Italian cartographer of the previous generation. Cantelli da Vignola in fact pioneered the Italian style of fine bold engraving that would eventually be embraced and expanded upon by Vincenzo Coronelli. His work drew the attention of Pope Innocent XI and Reggio Francesco II d'Este, the Duke of Modena, both of whom offered him a position as court geographer. Cantelli chose to work with the Due of Modena, in the service of whom he produced numerous maps and well as two large globes. He died in Modena in November of 1695. Cantelli da Vignola, Giacomo, Mercurio geografico overo guida geographica in tutte le partie del Modo..., Rome, (1668 - 1693). Very good condition. Original centerfold exhibits minor wear. Phillips (Atlases) 515. Shirley, R.W., (BL Atlases) T.ROSS-1a.